Buy a new Kindle for just $85? Normally a new wi-fi Kindle costs $139 — and even if you buy one that’s loaded with Amazon’s “Special Offers,” it’s still $114. But today, Amazon advertised a refurbished wi-fi Kindle 3 (with special offers) for just $84.99. The total savings? More than 25%. Within a few hours, they’d raised the price of a refurbished Kindle 3 (with special offers) — but only to $99.99. (Though that’s still a big discount of over 12%.) Throughout this morning, that big discount then seemed to disappear and re-appear around Amazon.com. At one point on the same page, Amazon warned shoppers page that “We’re sorry. There are currently no Refurbished listings for Kindle, Wi-Fi, 6″ E Ink Pearl Display – includes Special Offers & Sponsored Screensavers.” But when you then visited Amazon’s “Buy a Kindle” page, it was still listed as “In Stock” at the $99.99 price! And then shortly before noon, all the refurbished Kindles seemed to have disappeared. What’s going on? I think Amazon’s trying to reduce their inventory of Kindle 3s because they’re planning to release an even newer version of the Kindle in the next few weeks. That’s especially interesting, because I’d heard a rumor that Amazon was only releasing a color, touchscreen version of the Kindle (but not a new black-and-white Kindle with an e-ink screen). 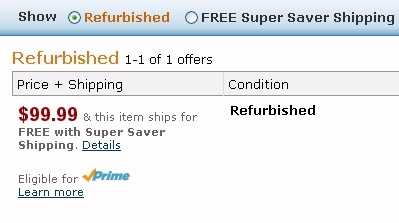 But if that rumor were true, it seems odd that Amazon would be reducing their inventory of refurbished Kindle 3s. Still, maybe Amazon expects there’ll be fewer people who want a Kindle 3 when there’s also a new color, touchscreen multimedia tablet. It’s pointless to speculate until Amazon finally makes their move. The bottom line is that if you want to buy a Kindle 3, you can get a good price if you keep your eye on the Amazon store. And if you keep re-loading the web page, there’s a chance that the prices will change again!